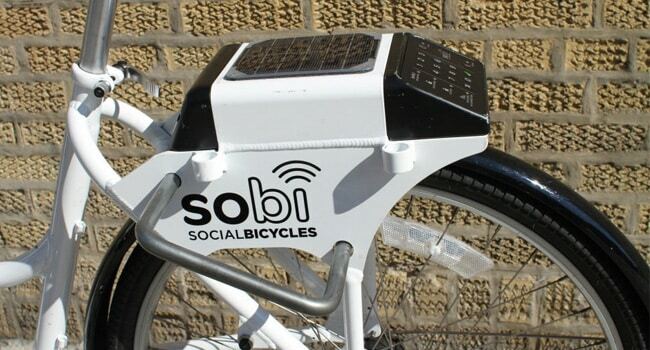 “Using wireless technology to enhance personal mobility.” is one of the taglines for SoBi new a new social bike share system created by entrepreneur Ryan Rzepecki. Although the idea of public bike sharing has been around for quite awhile, (the first large scale deployment came from the city of Paris when they launched ‘Vélib’ a system with 20,000 bikes in 2007) the SoBi system is different in that instead of large central racks from which the bikes are rented and returned, the SoBi model places all the technology for renting and tracking on the bike itself. 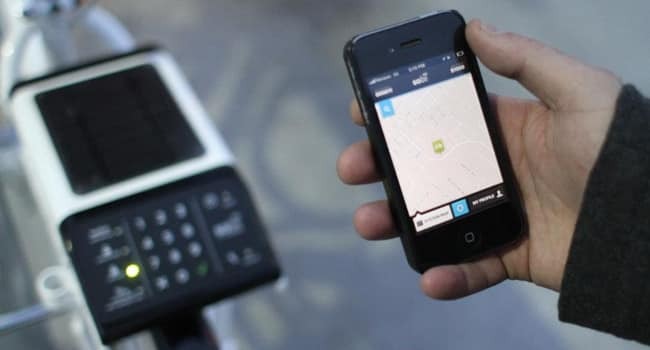 Riders can use their mobile phones to check-out available bikes and unlock them from anywhere (via a keypad and pin code sent from a centralized service). An on-board GPS and cellular system (all powered by pedaling cyclists) keeps track of how long they have been used for and where they have been placed at the end of their journey. Besides allowing for more flexibility for cities and riders the system also has startup costs that are around a quarter of the cost of using traditional docking-based systems (SoBi costs less than $1,000 per bike where typical systems cost between 3-4K per bike). Riders are incentivised to keep the bikes within certain areas via additional recovery fees, and you may be wondering what happens if your bike ends up with a flat tire? Independent operators maintain the bikes and you simply hit the “repair” button on the keypad lock and the bike will be flagged for later pick-up. The company is currently working with the city of Buffalo and San Francisco’s International Airport to test the day to day to success of the locks. You can check out the video below for more details on the scheme or follow the team’s progress as they launch the service at: Socialbicycles.com. Related: Liquid, Relay Rides (See what Rob Coneybeer did with a car for RelayRides).